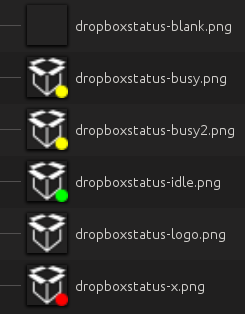 Icon from this package looks blurry compared to other tray icons on Plasma 5.7. Default dropbox icon (version 11.4 from AUR) looks pixelated. Perhaps it would be better to put this URL as Upstream rather than a snapshot? Hi, may I ask how you get these icons? Since I can't get it out of kfilebox package. Or maybe you can put on the original site of the artist?